Do you experience challenges with the process of window washing around your home or business premise? Your struggles are not enough to remove stains, water streaks and dirt from glass surfaces? 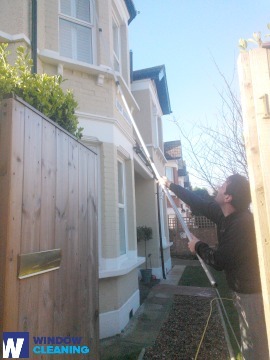 The specialists of window cleaning in Wapping will render you assistance! Say bye-bye to the endless hours of polishing and wiping – the skilled and experienced team members will manage this problem. You will be able to make the most of your extra time – just let us do this time-consuming and tedious work for you. Our professional approach will grant you lots of bonuses. We also provide our professional services in nearby areas: Commercial Road, Shadwell, Aldgate East, Stepney Green, Mile End Road. You can count on the abilities and experience of the experts for cleaning all kinds of windows. The glass surfaces in our proficiency are: small or double windows, bay ones and sash windows. Of course, if you have French doors, garden windows, greenhouse or skylights, we will make them spotless, too. With our advanced methods and next-generation machinery, we can tackle all kinds of window cleaning, even with hard-to-reach glass panes. The experts of commercial window cleaning will provide you with top-notch service for your work environment. We can go as high as the fourth floor of your building with our water-fed pole system. If you have high-rise windows, we will perform the cleaning with the help of our rope access equipment, designed specifically for hard-to-reach glass panes. All things considered, you can count on us for thorough window cleaning of all commercial property types - from small shops to the highest skyscrapers in London. We use the most advanced procedures to be sure that you get second-to-none window cleaning. With our water-fed extension pole system and jet washing methods, you will enjoy perfectly clear look of your windows. We attach our poles to water reservoirs in our vehicles to ensure that there is no risk for the exterior of your residence or business building. For higher windows, we employ entirely secured rope access technique. You can profit from these cleaning techniques now – just dial 020 3746 3113! Request our window cleaning in Wapping for your residence. We will use mentioner earlier tools – water fed extension pole system for easy-to-reach windows and rope access tools for the high-rise ones. For the entire process we use purified water. Request a service today – dial 020 3746 3113 and speak with our call centre staff. Or you can fill in our on-site booking form or use our chat facility.